FOXBOROUGH, Mass. – From 2005 till 2008, Michael Parkhurst was a rock in the New England Revolution’s back line, earning Rookie of the Year, Defender of the Year, and MLS Best XI honors while leading the team to three straight MLS Cup appearances and a U.S. Open Cup title in 2007. On Saturday night, Parkhurst made his return to Gillette Stadium, where he had so many memorable moments early in his career, but this time in opposition colors, guiding the Columbus Crew to a 2-1 victory over his former club. Parkhurst left MLS for Europe in 2008, at the age of 24, first joining FC Nordsjælland in Denmark where he played nearly five seasons, leading the club to its first ever Danish Superliga trophy in 2012 and two Danish Cups, while playing in both the UEFA Champions League and Europa League. Parkhurst then moved to Germany to join Bundesliga club FC Augsburg in December 2012, but after finding playing time limited there, returned to MLS in 2014. 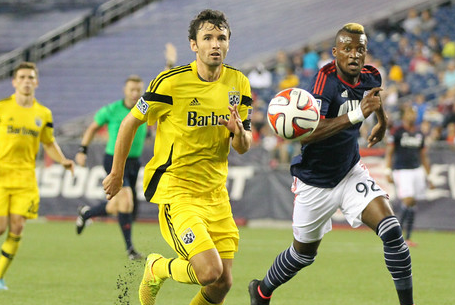 The Revolution still held Parkhurst’s MLS rights since the Cranston, R.I., had left on a free transfer, but the club opted to trade his rights to the Crew in exchange for their first round 2014 SuperDraft pick – which the Revolution used to take Steve Neumann – and allocation money. The trade meant the now 30-year-old Parkhurst would not return the club he grew up a fan of. Instead his homecoming came as part of the opposition and meant a stay in some unfamiliar territory: the visitor’s locker room. On Saturday, Parkhurst was a large part of the Crew’s victory. The U.S. National Team defender – who was part of the 30 man preliminary 2014 World Cup roster, but didn’t make the final cut – led all players with 92% passing accuracy, while also leading the Crew’s defense with three interceptions, and a blocked shot. The cerebral center back did all of that without committing a foul, a familiar stat-line to Revolution fans who saw Parkhurst win two MLS Fair Play Awards while committing just 32 fouls in 115 games for New England, an insanely low total for a defender. But Parkhurst also did something that was uncommon from his Revolution days: getting forward on set pieces. He nearly set up a goal in the 65th minute when he redirected a corner kick towards the net that his teammate Chad Barson back heeled past goalkeeper Bobby Shuttleworth for what at the time would’ve broken a 1-1 deadlock, if not for Lee Nguyen clearing it off the line. Parkhurst’s play on both ends of the field surely gave his family and friends in attendance – which the defender estimated at 35 to 40 people – something to cheer about. The win also propelled the Crew over the Revolution and into a playoff spot, moving up to fourth in the Eastern Conference, at least temporarily. For his former team, it meant an eighth straight defeat and dropping out of a playoff spot. While Parkhurst enjoyed his time back in New England and the familiar grounds, the opposition team certainly lacked familiar faces, with few regulars still remaining from his time with the club. Parkhurst noted there were just a couple players still on the team that he stays in touch with. Still, while his former teammates have dwindled in numbers, there are a few players on New England that remember seeing Parkhurst play for the club. Scott Caldwell, 23, who got the start at defensive midfield on Saturday remembered watching Parkhurst while he grew up a fan of the team in Braintree, Mass. But for those hoping a return to his hometown club is in the cards for Parkhurst before his career is over, the defender made clear he didn’t foresee it any time soon. The Revs fans should have BOO the team off the pitch last night To send a message to ownership and management there is need of a change?? ?